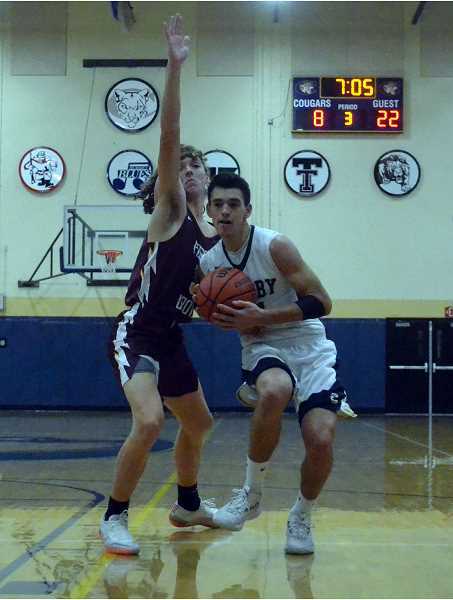 Canby boys' basketball team continues to struggle in the tough Three Rivers League (TRL). The Cougars came up short on Friday, Feb. 1 against the Tigard Tigers (6-1 in TRL play, 13-6 overall). Canby's slump increases to five straight after a close 50-43 loss to the no. 1 team in the TRL. There were two standout players for the Cougars, senior Rizdin Miller and sophomore Diego Arredondo who had 16 and 11 points respectively. Miller went 5-of-9 from inside the arc and went 2-of-4 from 3-point land. Arredondo, the leading sharpshooter for Canby, only sank one "3" but was effective from the midrange, nailing 4-of-6 shots. Sophomore Ben Bailey led the team with seven defensive rebounds and a block. The team shot well from inside, shooting 13-of-23 from 2-point range for 57 percent. From beyond the arc the team was a different story, Canby shot just 4-of-22 from downtown. Tigard, meanwhile, had a more moderate approach from the field, shooting 9-of-25 (36 percent) from 2-point range and 7-of-17 (41 percent) from 3-point range. Tigard also outrebounded Canby 32-20. Canby did win the turnover battle 8-7, and only surrendered 5 steals to the Tigers. Up next for the Cougars is Lakeridge. Canby (1-6 in TRL, 6-12 overall) will look to rebound against Lakeridge (0-7 in TRL, 6-12 overall) on Tuesday, Feb. 5. Canby has met Lakeridge twice before, once in tournament play and once in league, and walked away with the win both times.